Avant Chamber Ballet makes a rousing tribute to American Ballet at the Soluna Festival with guests from the Dallas Symphony Orchestra. Dallas — There’s nothing like hearing live music at a classical ballet performance. It adds some spontaneity to an otherwise technically fixed art form as well as a layer of anticipation for both performers and audience members. It was this anticipation that had audiences on the edge of their seats as Avant Chamber Ballet (ACB) broadened their artistic range in a near flawless performance Tuesday evening at Dallas City Performance Hall in conjunction with the Soluna: International Music & Arts Festival. Staying within the margins of the festival’s theme “Destination America” Puder put together an exciting program that included some of her favorite American ballet choreographers, including George Balanchine, Christopher Wheeldon and Paul Mejia, and also showcased the company’s ever growing versatility and musical awareness. Having been brought up on the Balanchine style it came as no surprise that ACB’s restaging of Balanchine’sValse Fantaisie paralleled the technical fortitude of the original. Glinka’s driving composition, arranged by ACB’s composer in residence Chase Dobson, guided the five females and one male through this whirlwind that can only be called pure dancing. As was Balanchine’s custom, leg beats and rises on and off pointe were accentuated with subtle head tilts and arm changes. Natalie Anton, Madelaine Boyce, Kristen Conrad and Kaitlyn McDermitt performed the springy corp steps without hesitation and beautifully captured the musical nuances with their elongated arabesques and breathy arm transitions. Christy Martin was a spitfire in the lead role with fellow dancer Peter Kurta. Martin showcased exquisite control as she stepped into a lengthyarabesque hold after completing a vigorous entrechatvariation. Kurta ate up the stage in his traveling jump sequences and maneuvered Martin through a series of assistedpirouettes and rotating body positions without qualm. Musicians Miika Gregg (violin), Lydia Umlauf (viola), Jennifer Humphreys (cello), Kara Kirkendoll Welch (flute), David Cooper (horn) and Saule Garcia (piano) partnered beautifully with the performers on stage with changing tempos, volumes and styles generating the same energies in the dancers. Paul Mejia’s Serenade in A challenged ACB’s Natalie Anton, Emily Dixon, Yulia Ilina and Rachel Meador with its musical intricacies and scrupulous technique. Choreographed in four parts, each section uses a different part of the body to highlight the nuances in this illustrious Stravinsky composition. The long-sleeved white leotards and matching ballet belts enhanced the dancers’ lines and did not detract from the detailed movements seen in the work. Right away the eye is drawn to the dancers’ upper bodies as they contract and release on different counts. These constantly changing counts made the simple plies with wrist flicks and back arches appear fresh and exiting. In the third section the fast tempo was accented by the dancers’ hips as they quickly tip-toed on the balls of their feet around one another. Pianist Garcia slowed the tempo down in the final section as the dancers focused on raising and lowering their arms to different counts and rhythms. Just as the title states, Puder’s new work Endless Arc was a continuous array of wide arcing movements, contracted torsos and explosive leg extensions. By breaking the piece into five parts the audience could fully appreciate Puder’s interweaving formation changes, complex petite allegro sections and push and pulling partnering skills. In the first section, Sarah Grace Austin set the tone when she performed a series of slow side bends and tendue steps with an inverted hip swivel. As Bela Bartók’s String Quartet No. 4 picked up tempo Austin and the other five dancers on stage exploded into a number of running jetes which led them off stage. In the second and fourth sections, Madelaine Boyce, Kirsten Conrad and Christy Martin made easy work of the traveling chaine turns and double pirouettes that came in between their running patterns, which had them circling close to one another before shifting directions. The simple rotating bourrees and slow walks which spread the group across the stage in the third adagio section was one of the most visually arresting moments of the whole piece. The audience was also pleased to see Tagir Galimov handling the classic partnering skills (i.e. rotatingarabesques, pirouettes) with more assertiveness and continuity. The piece came to a satisfying conclusion as the entire company executed a series of high powered traveling jumps and alternating battements before ending in diagonal spanning the stage. As they pivoted to the front with one arm curved up and the other down the stage went dark. Throughout the piece Charlton Gavitt’s bold color choices and abrupt lighting cues meshed with the sharp changes in the music and helped round out the work. These more traditional works were separated by two contemporary duets choreographed by Christopher Wheeldon. In The American pas de deux Michele Gifford clung to Shea Johnson as he manipulated different parts of her body. Flexed feet, broken arms and a contracted torso made up most of Gifford’s movements as Johnson swept her across the floor in a number of over the head lifts. The counterbalance holds and sustained lifts, which made up a bulk of the work, tested Johnson’s control and consistency with positive results. WhereasThe American was light and buoyant, Wheeldon’s There Where She Loved was grounded and tense with Gifford desperately reaching and arching away from Johnson as he dragged her across the floor on the tops on her feet. Soprano Corrie Donovan’s soul stripping rendition of Kurt Weill’s Je ne t’aime pas as well as her physical presence on the stage gave the couple courage to fully let themselves go which in turn made their performance more dynamic and believable. 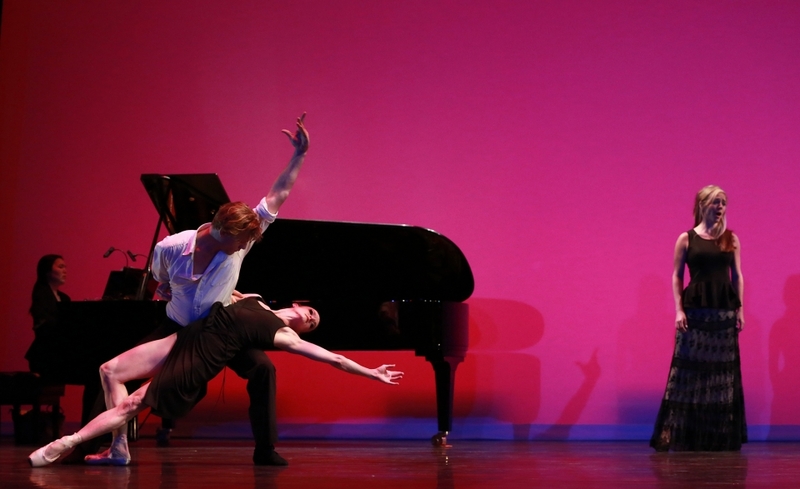 Guest artists Michele Gifford and Ronnie Underwood perform a Pas De Deux from Sylvia. Collin County Ballet Theatre effectively hits on every part of the ballet spectrum with the help of some local talent in Balle Fete Esprit de Danse. Richardson — From classical and romantic to contemporary and avant garde, Collin County Ballet Theatre’sBallet Fete Esprit de Danse had something for everyone to enjoy at the Eisemann Center for Performing Arts last weekend. To accomplish such a feat CCBT Directors Kirt and Linda Hathaway called upon some local dance companies for assistance, including Ballet Frontier of Texas, Epiphany DanceArts and Dallas Neo-Classical Ballet as well as guest artists Yuliia Ilina, Michele Gifford, Harry Feril and Ronnie Underwood. What could have been an unbalanced collaboration was instead an exciting display of varying balletic forms and individual artistry with a couple of standout moments from CCBT’s own pre-professional company members. The show opened with Kirt Hathaway’s Simple Symphony which had its premiere in 1982 with Lexington Ballet. Like the title states, this piece was very simple, from the pointe work to the formation changes, but by no means boring. The rudimentary steps (bourrées, changements, jetes) were done with exacting precision and uniformity. The six dancers skimmed across the floor with their triplets and bourrees as they weaved through one another. While the dancers point work was not always in sync, they paid meticulous care to their upper body positioning. Ilina and Feril’s pas e deux was a lesson in partner proficiency and artistic expression. Ilina’s wicked extensions and technical poignancy was complemented by Feril’s undeniable strength and innate ability to anticipate his partner’s needs. They never missed a hand connection and Feril handled the tricky press up lifts with ease. Next up was August Bournonville’s (1805-1879) Reel performed by Ballet Frontier of Texas to music by Lovenskold. Dressed in white tops, plaid kilts, black knee socks and character or jazz shoes, this 31-person ensemble performed a fast-paced Scottish jig that featured rhythmic stomping, quick partner exchanges and continuous formation changes. Bournonville was not into flashy jumps or overheated gestures and he preferred accenting the downbeat in the music; the dancers took to Bournonville’s demi-character style with a vigor that left the audience breathless by the end. Epiphany DanceArts piece, Rebirth, fused classical ballet technique with the expressive gesturing and wide arcing movement that we have come to expect from the group. The 12 dancers, dressed in various black tops and bottoms, executed a number of leg tilts, side reaches and back lunges as they continuously ran diagonally across the stage. A mashup of Beethoven and One Republic’s “5 Secrets” covered by The Piano Guys only heightened the sense of urgency in the dancers’ movements. The most surprising work of the evening came from Dallas Neo-Classical Ballet. Choreographed by Victoria TranShades draws from the mythological idea that ghosts or spirits of the dead reside in the shadows of the underworld, according to the program notes. The movement is inspired by butoh, a form of avant garde performance art that arose in Japan in 1959. Adorned in flimsy white dresses and pale-painted faces or painted bodies as in David Sanders case, the dancers moved stiffly around stage as if in a trance, stopping intermittently to convulse or lackadaisically sway side to side. Their body shapes were disjointed (broken wrist and turn-in feet) and everything was done in a slow manner to the unsettling hum of Tibetan singing bowls. The second half showcased the more traditional side of ballet with CCBT’s Mendelssohn, Longing for Spring and Le Corsaire Divertissement as well as the Snow scene from The Nutcracker performed by Ballet Frontier of Texas andSylvia Pas de Deux choreographed by Paul Mejia and performed by guest artists Michele Gifford and Ronnie Underwood (Oklahoma City Ballet). Gifford’s strengths came forth in her flexible spine and dynamic leaps and turns. Underwood surprised us all with his technical grace and exquisitely soft landings despite his broader frame. It was hard to take your eyes off CCBT company member Kade Cummings in Mendelssohn and Le Corsaire Divertissement. He has come a long way over the last two years. Gone is the cheeky Fitz (The Nutcracker) character and in his place a more disciplined dancer. He oozed grace and confidence. His far-reaching lines, precision turns and effortless jumps set him apart from the other dancers. CCBT member Emily Dunaway displayed great emotional depth with her solo in Ilina’s Longing for Spring. Her conviction could be seen from her tense fingertips down to her punctuated pointe work.